Lemontree was founded in 1999 by Thomas Martinsson, and a lot has happened over the years. These milestones illustrate some important events in the history of Lemontree. Everything from awards, to contracts and new partnerships. Lemontree is founded by Thomas Martinsson. Per Thelin is appointed and immediately made partner in the company. Tele1Europe becomes Lemontree’s first client. NetCom GSM in Norway becomes Lemontree’s first client outside Sweden. A strategy is developed to transform Lemontree into a solutions provider. A first partnership agreement is signed with the product development company Inktomi, and Ericsson becomes the first client to buy a solution. A framework agreement is signed with Tele 2, and Lemontree moves to an office near the Ericsson Globe. Lemontree opens its Norway office. DnB NOR and the University of Oslo become new clients in Norway and SEB and the Swedish postal service, Posten, become new clients in Sweden. Lemontree now has over 10 employees. A partnership is formed with the American company Progress Software. An agreement is signed with the telecoms operators Network Norway and NMT, for the supply of a solution for Order Management. The insurance companies AFA and Salus Ansvar become new clients, turnover increases by 160%, and the company has over 20 employees by the end of the year. Lemontree is established as a solutions provider for the public sector and a partnership is signed with the Swedish company Formpipe Software. The Civil Aviation Authority, Luftfartsstyrelsen, becomes Lemontree’s first public sector client for solutions. A partnership is established with HP Software to focus on Test Automation, and NetCom and Tele 2 become the first clients for this. A major agreement is signed with the Swedish Transport Agency Transportstyrelsen, The Equality Ombudsman (DO), Region Gotland and all of the Swedish National Pension funds, among others. Becomes the biggest partner to both Formpipe and Progress Software. During a prevailing financial crisis, turnover increases by 85% and a margin of 22.5% is achieved. The company is also named a “Gazelle Company” and a “Super Company”. By the end of the year, there are 55 employees. A framework agreement signed with TeliaSonera for the supply of Lemontree’s Test Automation solution. Sodexo becomes a new client for integration. Thomas Martinsson is nominated for Ernst & Young’ Entrepreneur of the Year. Lemontree grows to 80 employees by the end of the year and achieves a margin of 23.5%. Named a “Gazelle Company” and a “Super Company” for the second year running, and obtains a credit rating of AAA. All the major telecoms operators in Sweden and Norway are Lemontree clients. Bankgirot becomes a new client in the company’s focus on the financial sector. Over 70 public sector businesses are Lemontree clients. Lemontree signs a partnership agreement with Software Innovation. Lemontree signs a major agreement with SIDA for the supply of Public 360, amidst tough competition from all suppliers. Draws up a framework agreement with the Swedish Public Employment Service, Arbetsförmedlingen. Surpasses 100 employees, with growth at a rate of almost 20%. The year brings many new clients, including Skanova, Skövde Municipality, The Swedish Institute, Sollentuna Municipality, Swedac, Inspecta, the DNB Savings Bank Foundation, Sarpsborg Municipality and more. The eGo solution is launched and Haparanda city becomes its first client, followed by Värmdö Municipality. The company moves to a new, bigger office in Stockholm and is named a “Gazelle Company” for the fourth year running, and a “Fastest Growing Company” for the first time. Arne Wallmon is elected as Chairman of the Board at the EGM in January. The Norwegian Labour and Welfare Administration, NAV, selects Lemontree for the comprehensive delivery of services and software for testing. Ahrens Rapid Growth name Lemontree a “Fastest Growing Company” for the second year in a row. A framework agreement is signed with the TeliaSonera group, as expert supplier in Test & Quality Management. Lemontree draws up a framework agreement for the E-Archive with SKL Kommentus Central Purchasing Association, to supply the eGo eArchive. Bankgirot selects Lemontree as partner for the implementation of automated tests. Lemontree establish partnerships with Grid-Tools and Dassault Systemes / Exalead . Stockholm Stadsbyggnadskontor and the Municipality of Lindesberg new customers where Lemontree implements solution for information management. Continued successful work with TeliaSonera regarding test automation . 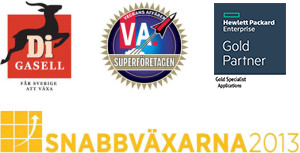 Appointed by HP as the only Scandinavian partner who can offer new and existing customers the support and maintenance of the HP Software testing tools . Petra Förnell appointed as the new CEO .